I have a tendency to pick up broken synths on eBay and try to fix them up. Many bargains can be had, and more than a few lemons. I’ve had pretty good luck so far, and managed to make a bit of money buying, repairing, and reselling these instruments. Most times the problem is easy to fix. Sometimes, it is laughably simple. Many people use an AC wall wart where a DC one is needed, and then think it’s broken because of the hum and buzz in the audio output. Another time I had a Korg EX-8000 that wouldn’t make any sound. Turns out that the split zone parameters (which were not silkscreened on the front panel – probably because of a software update) were set such that the instrument wouldn’t play any sound. So, I found a used Yamaha SY-99 on eBay. It was missing the power supply…however the seller claimed that it ‘was still avialable’ (q.v.) from Yamaha. I already had a SY-99, and figured I could sell it, buy the broken one for cheap, buy a replacment PSU, install it, and come out ahead, right? I paid for the SY99, and the seller promptly shipped it to me UPS ground. Now, say what you want about UPS, but so far I’ve had good luck with them (although I use DHL for my own shipping). When it showed up, I lugged it up the stairs and opened it up. My heart sank as I saw shards of black plastic everywhere. Upon closer inspection, the two black plastic end caps had been thoroughly smashed. Although they retained their basic shape, there was no support attachments left, and in fact, there were only four screws holding the bottom plate to the instrument…the plate that normally anchors the sides in place. A call to the Yamaha parts department revealed that the end caps were still available, for about $50 each. However, the power supply, transformer, AC cord clamp, and software updates were no longer available. They couldn’t even sell me the black metric screws that held the bottom plate on!!! They did have the service manual, so I purchased one, and waited for the parts to arrive. Meanwhile, I had contacted the seller and conveyed my profound disappointment on the condition of the instrument, the fact that contrary to his assertion that power supplies could be had, they were nowhere to be found. I also had to ship the instrument back to Baton Rouge, so the local UPS shipping depot could assess a damage claim. Their conclusions, to nobody’s surprise, was that the seller had packed the shipment improperly. I had the SY-99 shipped back to me, fingers crossed, dreading the condition in which it would arrive. I thought that I might try a well-respected local service center, Advanced Musical Electronics. I had used them before and had been very happy with their service. I also knew that they had access to vendors and resources that I didn’t. They don’t sell parts to the public so I decided to let them get all the parts and install them (it turns out the SY99 needed a new high G key as well). A few days later, I got a phone call. They had installed the new high G key, but power supplies were nowhere to be found, nor were the software updates. Looks like the people in the Yamaha service department knew their stuff. The eBay seller by this point had stopped responding to my emails about the UPS claim, which I knew would be futile since it wasn’t insured or packed properly. Thanks for nothing. So by this point, I knew I had to ‘do the nasty’ i.e. come up with a power supply on my own. Once again, I had to use my guerilla reverse engineering skillz to bring this bucket bolts back to life. The SY99 service manual, although reasonably priced, seemed to contain mostly documentation (in English and Japanese) about the service diagnostic features. At the very end of the manual were the schematics, reduced in size so much that I needed a magnifying loupe to read them. However, the manual did contain images of the bare PC board…exactly what I needed to get started. As with other boards I’ve done this way, the correct scaling had to be applied to the drawing. About the only reference point I had on the artwork was the spacing of the pads of the TO-220 regulators. Using this, I was able to determine that the drawing needed to be scaled 120%. 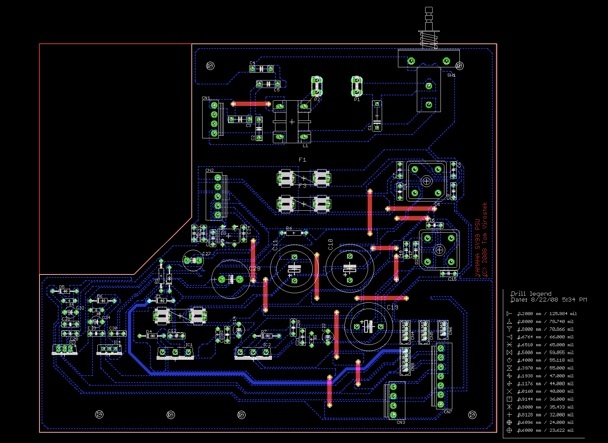 I used Afloat, a handy utility, which allowed me to overlay the original PCB artwork with the PCB design program, to trace the design. FIrst, component footprints were placed, then connections made with normal sized tracks, then finally, the large copper areas were filled in with polygons. I had the boards manufactured without silkscreen or soldermask, so save money. Most of the parts were easy to find. The smaller connectors were metric Molex microblade connectors, the larger ones JST connectors. 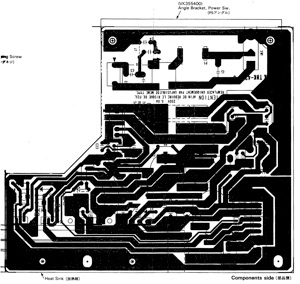 The two large 5A regulators were actually populated with smaller regulators on the original SY99 supply. I replaced these with LT1084 regulators which matched the PCB layout. The original Yamaha power transformer was also not availaable, so I used a toroidal triple-secondary transformer and made a custom mounting plate that matched the internal extrusion dimensions. The board ended up working very well. I had to machine a heatsink to fit in place of the original Yamaha one (surprisingly, no longer available). Moral of the story: you want something done right, you have to do it yourself. And to the person who sold me this keyboard: Thanks for your half-assed attempt to help me, but I’ve taken care of it. Hi, same thing happened to the end cheeks on my sy-99. I think they are pretty prone to this damage. I am thinking of putting wooden end cheeks in. Separately, my 4zone aftertouch has failed. Do you know anything about this? I reckon it’s mechanical rather than electric and perhaps I should take the whole keybed out and check it out. Thanks!The aftertouch on the SY99 is a plastic strip that is attached under the keybed. The end of it plugs into a small PC board near the power supply. The connector may have come off or the aftertouch needs adjustment (on the small board). Can you post the contact information for getting the end caps from Yamaha for the SY99? The part numbers are VH809500 and VH809200. They are called the left and right end blocks. Unfortunately they are not available from Yamaha US and Japan has stopped manufacturing them. Other countries local Yamaha service centers may have some left, though. I just bought an SY99 on eBay and didn’t think to ask about a power supply until it had already shipped. It turns out that it will not have one included when it arrives. I don’t see any listings for a power supply specific to this model online. Can anyone give me a recommendation? The SY99 power supply is internal – was it removed prior to you buying it? Yamaha no longer makes this power supply, but I succesfully cloned it, although I had to make a mounting plate for the toroidal transformer that I used. What aftertouch readings do you get in the ‘test’ screen (#16)? I think I am lacking gain as I can only get 20. I know what you mean, it weighs so much and its quite unwieldy but it does sound fantastic. Better than the Fs1r somehow. I think my aftertouch sensor is the problem because i do not get degrees of aftertouch if i adjust sensitivity. I think i need to peel the sensor away from the felt and clean it. This might be useful for other people owning an SY99. The original transformer that used to be available through the consumer audio division (it was also used on audio amplifiers. you could get it at best buy part department) is no more available. However there is a company based in New York who makes a 35W transformer matching the Yamaha specs and that is a drop-in in the sy99. The company is signal transformer (www.signaltransformer.com) and the part number for the sy99 transformer is : MT-7-12. take a look. I upgraded an sy99 from japan using this transformer to bring it to support 117V. I just needed to replace the power cord to a UL spec cord for 35W and it was good to go.